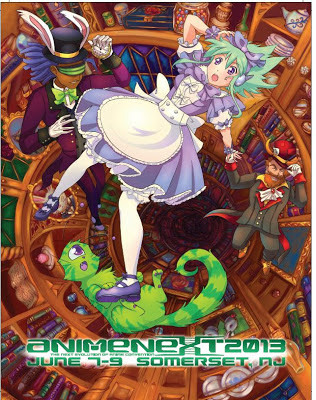 The Insatiable Critic: The Critic is coming AnimeNEXT 2013! the cover of this year's program guide! Hey everyone! I will be attending and staffing this year's roundup of AnimeNEXT, the convention held in Somerset, NJ celebrating Japanese anime/pop culture from June 7-9. I'll be participating in the following panels, along with Dr. Bill Ellis, professor emeritus of Penn State University and owner of Sensei's Anime Gallery, and my colleagues Dylan Ferrara and Casey Schoenberger. Panel descriptions are courtesy of Dr. Ellis. What's the greatest anime you've never heard of? Maeterlinck's Blue Bird? Alps no Shojo Heidi? Ai to Yuki no Pig Girl Tonde Burin? Gegege no Kitaro? This panel will survey out-of-the-way anime series, some of which are thus far unknown to most fans. This panel will look at some of the controversial issues raised by the recent emergence of "bronies," or adult fans of the Hasbro "My Little Pony: Friendship is Magic" series, and how such issues relate also to certain Japanese anime magical girl series. Original animation art from many Japanese anime series, classic and new, is easy to collect at affordable prices. This panel will survey the kinds of art that is available, including cels (painted plastic sheets used in the making of the anime), original production backgrounds, and key animators' sketches. Strategies for acquiring and conserving these artifacts will be covered. I hope to see you there! Be sure to grab a program guide; I edited and wrote for it and my friend Sarah Moulder of Studio Kitsu designed it. ALSO: I'll also be taking photos of creative cosplayers and posting the images in a slideshow on my blog here after the con. If you run into me, you'll also get the opportunity for some Insatiable Critic swag; this bangin' bookmark designed for me my Tina Pratt, the creative mind behind the webcomic Paul Reveres.